From October 27 to 28, 2017, sponsored by Shanghai KSB Pump Co., Ltd. and co-organized by Xiamen Hukai Pump Co. Ltd., the "KSB IB Product Technology Training Seminar" was held in Yuehua Hotel of Xiamen, Fujian Province. 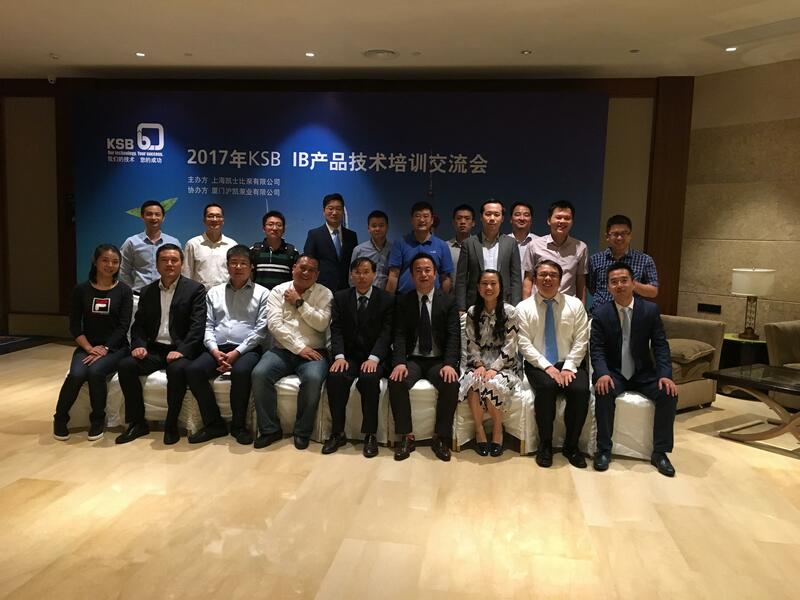 This meeting aimed to expand the market influence of the KSB brand in southern China, enhance brand value, integrate various advantageous resources, boost industry confidence and increase customer's awareness of KSB products. At the same time, it also provided customers with a platform for face-to-face communication with KSB. On October 27, 2017, the KSB IB Product Technology Training Seminar kicked off at the opening address by Mr. Gao Jinsong, the company's Sales Director. The meeting was chaired by Mr. Ma Jian, Head of KSB's Southern Region of Spare Parts Services and Technical Transformation, in South China. At the meeting, Mr. Jing Hongbo, Sales Manager, gave an introduction of KSB and its IB business development, Pan Zaibing, Director of R&D Department, introduced energy products and power plant retrofit businesses (SQR front pump), Zhou Wenchao, Senior Manager of R&D department, introduced the circulating pump, water and sewage transformation products for the power plant, and all the senior sales technical engineers introduced the water and sewage reclamation business and presented cases, as well as, services in power plant water circulating pumps and the system energy saving business. All the participants expressed their full understanding of the development milestones, corporate culture and positioning of KSB, as well as, the performances in various industries. At the customer interaction on October 28, 2017, the "development prospects of KSB in various client companies in the context of Industry 4.0", were fully discussed. The guests had a lively exchange and discussion on KSB's sustainable development in energy saving and emission reduction, as well as, how to reduce equipment maintenance costs and provide solutions during their life cycle. The meeting ended with the warm exchange between guests and technical experts of the company. The meeting was led by KSB's Sales Director Gao Jinsong, R&D Director Pan Zaibing, and Senior R&D Manager Zhou Wenzhao, which explained the company's attention to and hope in IB’s South China market. The purpose of the meeting is to promote technological exchanges and cooperation between the Company and customers in various industries, so as to achieve mutual benefits and win-win situations. In particular, the strategy of green, low-carbon and people-oriented sustainable development aims at pooling the power of all enterprises, and advocating for new social entrepreneurships. To this end, we are willing to advance against wind and waves, adhering to the purpose of "becoming a world-class pump and service provider". Let's roll up our sleeves and work harder, and continue to develop new business growth!